Andrew W. Mellon Collection, National Gallery of Art, Washington, D.C. The Washington Family by Edward Savage (1789–1796). The Washington Family by Edward Savage is a life-sized group portrait of U.S. President George Washington, First Lady Martha Washington, two of her grandchildren and a servant or slave. Based on life studies made early in Washington's presidency, Savage began work on the oil painting in New York City during 1789–1790 and later completed it in Philadelphia during 1795–1796. The National Gallery of Art in Washington, D.C., presently displays the large painting (7 feet (2.1 m) x 9.3 feet (2.8 m)). The image was a famous one in the 19th century. Prints were mass-produced by Savage beginning in 1798, and by John Sartain in 1840. Washington himself ordered four prints of Savage's engraving, hanging one in the family dining room at Mount Vernon. The Library of Congress holds in its collections a print of a color engraving that Savage and Robert Wilkinson published in London in 1798. The northerly direction to the left to which a magnetic compass on the base of a globe points and topographical details of the view indicate that the family is on the west bank of the Potomac River at Mount Vernon, occupying an idealized rendering of the portico that Washington designed for the house. Shown are Martha's grandson George Washington Parke Custis (called "Wash" or "Washy"), George Washington, Martha's granddaughter Eleanor Parke Custis (called "Nelly"), Martha and a black servant of uncertain identity (perhaps the enslaved Christopher Sheels, William (Billy) Lee or Austin). With a plan of the future city of Washington in front of her, Martha Washington is, according to Savage's catalogue, "pointing with her fan to the grand avenue". Some descriptions of the painting state that the "grand avenue" is Pennsylvania Avenue. However, the broadest and most prominent "grand avenue" that the city plan illustrates has actually become the National Mall (see: L'Enfant Plan). Holding a caliper, young George's right hand rests near the top of the globe, which lacks geographical markings. A museum's description interprets this portion of the scene as representing American hopes for rising global significance. A researcher has found that the perspective of the painting terminates at George Washington's heart. An oil painting by Peter Waddell entitled A Vision Unfolds debuted in 2005 within an exhibition on Freemasonry that the Octagon House's museum in Washington, D.C., was hosting. The painting was again displayed in 2007, 2009, 2010 and 2011, first in the Joslyn Art Museum in Omaha, Nebraska and later in the National Heritage Museum in Lexington, Massachusetts and in the Scottish Rite Center of the District of Columbia in Washington, D.C. 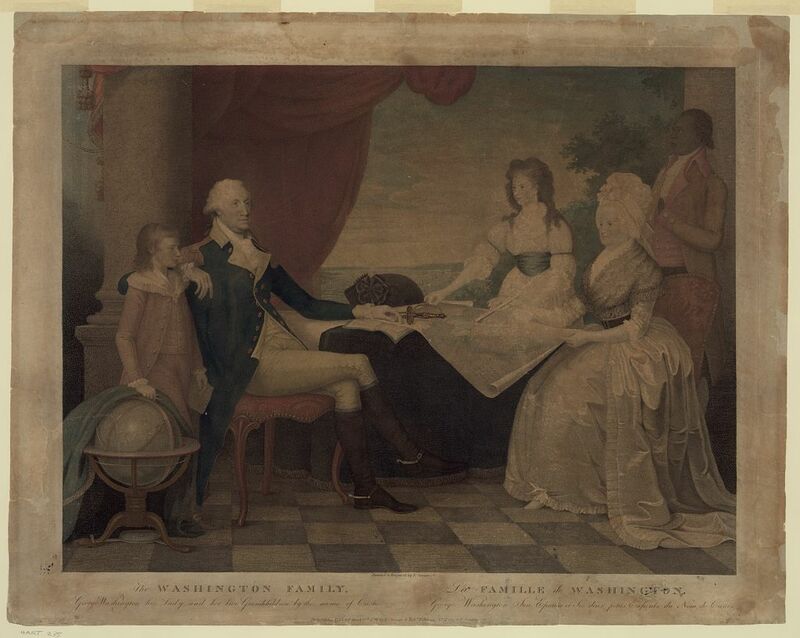 Containing elements present in The Washington Family, Waddell's history painting depicts a meeting that is taking place within an elaborate surveying tent. In the imaginary scene, African American surveyor-astronomer Benjamin Banneker presents a map of the Territory of Columbia (see: Founding of Washington, D.C.) to President Washington and surveyor Andrew Ellicott. ✪ Did Martha Washington Have Children With George Washington? ^ a b c d e Manca, Joseph (Fall 2011). "A Theology of Architecture: Edward Savage's Portrait of George Washington and his Family". Source: Notes in the History of Art. Chicago: The University of Chicago Press Journals. 31 (1): 29–36. doi:10.1086/sou.31.1.23208548. JSTOR 23208548. Retrieved 2017-08-28. ^ Howard, Hugh (2009). Chapter 7: "The Washington Family". The Painter's Chair: George Washington and the Making of American Art. New York: Bloomsbury Press. pp. 138–156. ISBN 9781596912441. LCCN 2008028228. OCLC 233591858. Retrieved 2017-08-28 – via Google Books. ^ Savage lived in London, 1791–94, and did not resume work on the painting until after his return to the United States. ^ Savage, Edward. "The Washington Family 1789-1796". Retrieved October 23, 2018. ^ "The Washington Family" (PDF). The New York Times. 1892-12-30. ^ (1) "Edward Savage". Digital Encyclopedia. Mount Vernon, Virginia: George Washington's Mount Vernon. 2017. Archived from the original on 2016-03-20. Retrieved 2017-08-28. Upon his return to the United States in 1794, Savage married Sarah Seaver, completed his group portrait of the Washingtons, and immediately set to work exhibiting and engraving the large-scale painting. Washington himself ordered four copies, hanging one in the family dining room at Mount Vernon. ^ a b c "Description". The Washington Family. Winston-Salem, North Carolina: Reynolda House Museum of American Art, Wake Forest University. Archived from the original on 2017-08-28. Retrieved 2017-08-28. ^ "Enslaved Persons of African Descent in the President's House". The President's House in Philadelphia. Philadelphia, Pennsylvania: Independence Hall Association (US history.org). 2017. Archived from the original on 2017-08-28. Retrieved 2017-08-28. ^ L'Enfant, Peter Charles; Library of Congress (1991). "Plan of the city intended for the permanent seat of the government of t[he] United States: projected agreeable to the direction of the President of the United States, in pursuance of an act of Congress, passed on the sixteenth day of July, MDCCXC, "establishing the permanent seat on the bank of the Potowmac"". Facsimile: Computer-assisted reproduction of Pierre Charles L'Enfant's 1791 manuscript plan for the city of Washington, produced by the U.S. Geological Survey for the Library of Congress. Washington, D.C.: Library of Congress. LCCN 97683585. Retrieved 2017-03-05. Published by the Library of Congress in 1991 with support from the National Geographic Society, the U.S. Geological Survey, and the National Park Service. In Repository of the Library of Congress Geography and Map Division, Washington, D.C.
^ Savage, Edward. "The Washington Family 1789-1796". Washington, D.C.: National Gallery of Art. Archived from the original on 2016-09-14. Retrieved 2016-10-24. ^ (1) Pfanz, Donald C. (1981-02-11). "National Register of Historic Places Inventory Nomination Form: National Mall". National Park Service. Retrieved 2010-03-17. (2) Hanlon, Mary. "The Mall: The Grand Avenue, The Government, and The People". University of Virginia. Retrieved 2010-05-05. (4) "Map 1: The L'Enfant Plan for Washington". National Park Service. Archived from the original on 2009-01-21. Retrieved 2009-10-27. Note: L'Enfant's key to the federal city's plan states that "H" is the "Grand Avenue, 400 feet in breadth, and about a mile in length, ....". This feature is now the National Mall. (5) Glazer, Nathan; Field, Cynthia R., eds. (2008). A Chronology of the Mall. The National Mall: Rethinking Washington's Monumental Core. Baltimore, Maryland: The Johns Hopkins University Press. p. 179. ISBN 978-0-8018-8805-2. OCLC 166273738. Retrieved 2015-01-02 – via Google Books. ^ "Description". The Washington Family. Winston-Salem, North Carolina: Reynolda House Museum of American Art, Wake Forest University. Archived from the original on 2017-08-28. Retrieved 2017-08-28. The boy stands to his right, dressed in a fine suit with a wide starched collar. His hand rests on a globe, representing American hopes for rising global significance. ^ George Washington Inn (2009-03-11). "The Washington Family". Mount Vernon, Virginia: George Washington Inn and Estate. Archived from the original on 2017-08-30. Retrieved 2017-08-30. (2) "Biography". Peter Waddell. Peter Waddell.com. Archived from the original on 2012-01-09. Retrieved 2016-10-22. Exhibitions: ... 2005: The Initiated Eye: Secrets, Symbols, Freemasonry and the Architecture of Washington DC. The Octagon Museum, Washington, DC. (3) "Masonic Art Exhibit Opens at the Octagon". The Scottish Rite Journal of Freemasonry: Southern Jurisdiction, U.S.A.: Current Interest: July–August 2005. Washington, D.C. Archived from the original on 2016-10-24. Retrieved 2016-10-23. Tuesday, May 17, was the grand opening of the Octagon Museum's phenomenal exhibit, "The Initiated Eye: Secrets, Symbols, Freemasonry, and the Architecture of Washington, D.C." Twenty-one paintings by Peter Waddell showcased the little-recognized contribution of Freemasons to the design and architecture of our nation's capital. (5) "Benjamin Banneker". The Initiated Eye: Freemasonry and the Architecture of Washington, D.C. (exhibition). Lexington, Massachusetts: National Heritage Museum. 2009-12-17. Archived from the original on February 26, 2010. Retrieved 2016-10-22. The Initiated Eye" presents 21 oil paintings by Peter Waddell based on the architecture of Washington, D.C., and the role that our founding fathers and prominent citizens – many of whom were Freemasons – played in establishing the layout and design of the city. ... The painting shown here depicts a meeting between President George Washington (1732–1799) and surveyors Andrew Ellicott (1754–1820) and Benjamin Banneker (1731–1806). Congress designated the location of the new capital on January 24, 1791. Elliott and Banneker surveyed the ten-mile-square tract of land and produced a base map of the area. ... The Initiated Eye" opens December 19, 2009 and will be on view through January 9, 2011. (6) "A Vision Unfolds". The Initiated Eye: Panel 1. Washington, D.C.: The Grand Lodge of Free And Accepted Masons of the District of Columbia. 2013. Archived from the original on October 23, 2016. Retrieved 2016-12-02. A Vision Unfolds - Congress designated the location of the new Capitol on January 24, 1791. It was a ten-mile square parcel of land along the Potomac and Eastern Branch Rivers. Andrew Ellicott and Benjamin Banneker surveyed the tract of land and produced the base map. Banneker, a self taught African American surveyor and astronomer, plotted the locations of the forty boundary stones one mile apart along the entire perimeter. Note: Panel 1 contains a high-resolution image of A Vision Unfolds. (7) "Grand Lodge History & The Initiated Eye Painting Exhibit". Washington, D.C.: The Grand Lodge of Free and Accepted Masons of the District of Columbia. 2011-10-26. Archived from the original on October 23, 2016. Retrieved 2016-10-23. Illustrious Leonard Proden, 33˚, S.G.I.G. of the Supreme Council in D.C and Past Grand Master of Masons in D.C is pleased to announce that the Valley of Washington, Orient of the District of Columbia, will celebrate the 200th Anniversary of the founding of the Grand Lodge of Free and Accepted Masons of the District of Columbia on Tuesday, November 15, 2011. All brethren, their family, and friends are invited to participate in this festive evening which will include: ... A special viewing of "The Initiated Eye", the heralded collection of D.C. Masonic-themed paintings, on exhibition in Washington, D.C. again for the first time in over five years. The artist, Peter Waddell, will be on hand to present his latest addition to the collection, a celebratory painting commemorating the Bicentennial of the Grand Lodge of D.C.
(8) Ellicott, Andrew (1793). "Territory of Columbia". Maps. Library of Congress. Archived from the original on 2016-10-11. Retrieved 2016-10-22. Notes: ... Accompanied by positive and negative photocopies of 3 letters dated 1793 relating to the map, 1 of which signed by: And'w Ellicott. Wikimedia Commons has media related to The Washington Family (1789–1796) by Edward Savage. National Gallery of Art (2014-05-30). "The Washington Family, 1789–1796, Edward Savage" (video). Retrieved 2017-08-30 – via YouTube.